and the Lord by sharing what I have learned from my three years married, but nearly nine years total with my wonderful man! This week's topic for me is to be transparent. We continue to hear that a secret to a great marriage is that yucky word for us who are challenged in this, yep you guessed it....Communication!!! One thing I've learned in my own marriage is that I can't expect my husband to communicate with me if I'm not open and honest with him, hence being transparent. So what does being transparent look like in a marriage? A wise pastor's wife at church told me if I want to honor God by being a Godly wife I have to help my husband be the leader. Most men I've been told, have a built in or God given desire to lead, but that desire diminishes each time a wife criticizes, belittles (even if you think you're just joking, it's not a joke to him), continually nags (which really means you don't have faith in or no trust in your husband) or under appreciates her husband. A way to nurture his God given desire to lead is by being his biggest supporter and helper. Ironically enough one of the best ways, my pastor's wife told me, to help him to lead is by showing him how to help you. Weird huh? Now I'm not talking help as in having him do your honey do list! I'm talking emotionally and then yes we're back to my point of being transparent. Most men cannot confidently lead his wife if he doesn't feel he knows what makes her tick. If he doesn't really know his wife then he'll be less likely to be secure in making big decisions in the home. He may feel as if he'll be criticized by you and so on. So see ladies... Our men feel secure when we gently help them to see what we need from them which makes us better helpers! I sure hope I didn't just confuse everyone and if I did, then just shoot me an email. Beautiful post! I think being transparent is so important in a marriage! 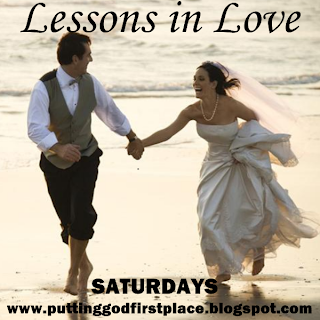 Thank you so much for joining me in sharing our Lessons in Love! Great post, loved it! When our kids were little, I had to learn to involve my husband with their discipline. I wanted them to see him as the leader of our home, not me. So, I disciplined during the day as needed because I didn't want them to dread him coming home. But when daddy came home, I directed the kids to him. I told him I wanted him to be in charge when he was home. I do think that we need to tell them what we need. How else will they know?